AMD (NYSE:AMD) today announced revenue for the first quarter of 2012 of $1.59 billion, net loss of $590 million, or $0.80 per share, and operating loss of $580 million. The company reported non-GAAP net income of $92 million, or $0.12 per share, and non-GAAP operating income of $138 million. First quarter non-GAAP net income excludes: the previously disclosed charge of $703 million for a limited waiver of exclusivity of certain 28 nanometer (nm) APU products from GLOBALFOUNDRIES Inc.(GF) related to the 2012 Amendment to the Wafer Supply Agreement; amortization of acquired intangible assets of $1 million; a restructuring charge of $8 million; SeaMicro, Inc. (SeaMicro) acquisition costs of $6 million, and a tax benefit related to the SeaMicro acquisition of $36 million. - Gross margin was 2 percent due to the previously disclosed charge of $703 million for a limited waiver of exclusivity for certain 28nm APU products from GF. - Non-GAAP gross margin was 46 percent, flat sequentially. - Cash, cash equivalents and marketable securities balance, including long-term marketable securities, was $1.71 billion at the end of the quarter. - Cash payments in the quarter included $281 million related to the SeaMicro acquisition and $150 million related to the limited waiver of exclusivity of certain 28nm APU products from GF. 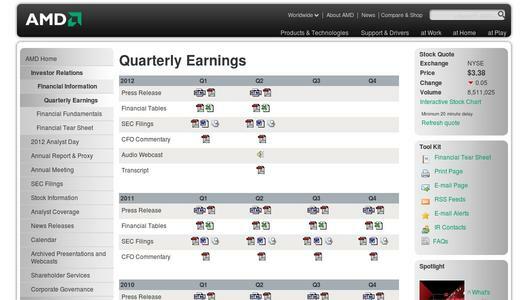 - AMD's first quarter of 2011 had 14 weeks of business compared to 13 weeks for the first quarter of 2012. - Computing Solutions segment revenue decreased eight percent sequentially and was flat year-over-year. The sequential decrease was driven by seasonally lower sales in the Client business. - Operating income was $124 million, compared with $165 million in Q411 and $100 million in Q111. - Microprocessor ASP decreased sequentially and was flat year-over-year. - AMD announced and began shipping the follow-on to its essential notebook platform "Brazos," its bestselling platform ever. The new essential notebook platform, codenamed "Brazos 2.0," delivers improved performance, extended battery life and many new features. Systems based on "Brazos 2.0" are expected to be available in the second quarter. - AMD ramped volume production of its second generation A-Series APU, codenamed "Trinity," in anticipation of global notebook availability from leading OEMs in the second quarter. "Trinity" delivers twice the performance-per-watt compared with AMD's current generation A-Series APU. Systems powered by "Trinity" will enable outstanding entertainment and gaming performance with superior battery life. - Dell, Tyan, MSI and Fujitsu are among the partners that introduced systems based on AMD Opteron(TM) 3200 processors targeting hosting customers who require enterprise-class reliability at desktop-class price points. The new server platform delivers price-performance and power-per-core advantages compared to competitive offerings. - Telus, a leading Canadian Telecommunications provider, selected the AMD Opteron 6200 Series processors to power its latest offering, the TELUS AgilIT Virtual Private Cloud. - AMD announced two new heterogeneous computing milestones, both with the objective of enhancing the user experience and nurturing future software development. AMD announced an investment through AMD Ventures in Nuvixa, Inc., a developer of gesture-based video communication and presentation solutions, and the first AMD Fusion Center of Innovation was established at the University of Illinois at Urbana-Champaign. - Graphics segment revenue was flat sequentially and decreased 7 percent year-over-year. GPU revenue was up in a seasonally down quarter, due to higher improved desktop GPU ASP in the channel, offset by seasonally lower game console royalty revenue. The year-over-year decrease was primarily driven by lower demand for desktop and mobile graphics. - Operating income was $34 million, compared with $27 million in Q411 and $19 million in Q111. - AMD reached a major milestone with worldwide availability of its full line of next generation 28nm AMD RadeonTM HD 7000 Series desktop GPUs in less than three months. In addition to the AMD Radeon HD 7950 Series GPU, AMD introduced the first graphics card to break the 1 GHz barrier, the AMD Radeon HD 7770 GPU. AMD also launched the AMD Radeon HD 7800 Series GPU featuring 2GB of GDDR5 memory for serious gamers. - AMD announced an amended Wafer Supply Agreement with GF that established a negotiated wafer pricing based on a take or pay arrangement in 2012 and established a framework for wafer pricing in 2013. AMD transferred its remaining ownership interest in GF to GF and GF waived the exclusivity arrangement for AMD to manufacture certain 28nm APU products at GF for a specified period. - AMD acquired SeaMicro, Inc., a pioneer in energy-efficient, high-bandwidth microservers. The acquisition accelerates the company's strategy to deliver disruptive server technology and positions AMD to expand its current server offerings to provide customers and partners with low-power, low-cost, high-bandwidth server solutions. AMD expects revenue to increase 3 percent, plus or minus 3 percent, sequentially for the second quarter of 2012. AMD will hold a conference call for the financial community at 2:00 p.m. PT (5:00 p.m. ET) today to discuss its first quarter financial results. AMD will provide a real-time audio broadcast of the teleconference on the Investor Relations page of its Web site at AMD. The webcast will be available for 10 days after the conference call. This document contains forward-looking statements concerning AMD, its second quarter of 2012 revenue, demand for the company's products, that the company will have sufficient supply of company's products to meet customer demand, its future growth, its ability to deliver sustained success, its strategy to deliver cash flow and earnings growth, its server strategy and growth opportunities, the anticipated benefits of from AMD's acquisition of SeaMicro, the timing of future products that incorporate the company's products, and the features of these new products which are made pursuant to the safe harbor provisions of the Private Securities Litigation Reform Act of 1995. Forward-looking statements are commonly identified by words such as "believes," "expects," "may," "will," "should," "seeks," "intends," "plans," "estimates," "anticipates," "projects," "would," and other terms with similar meaning. Investors are cautioned that the forward-looking statements in this document are based on current beliefs, assumptions and expectations, speak only as of the date of this document and involve risks and uncertainties that could cause actual results to differ materially from current expectations. Risks include the possibility that Intel Corporation's pricing, marketing and rebating programs, product bundling, standard setting, new product introductions or other activities may negatively impact the company's current plans; the company may be unable to develop, launch and ramp new products and technologies in the volumes that are required by the market and at mature yields on a timely basis; that its third party wafer foundry suppliers will be unable to transition the company's products to advanced manufacturing process technologies in a timely and effective way or to manufacture the company's products on a timely basis in sufficient quantities and using competitive technologies; the company will be unable to obtain sufficient manufacturing capacity or components to meet demand for its products or will not fully utilize its projected manufacturing capacity needs at GF's microprocessor manufacturing facilities for 2012; that customers stop buying the company's products or materially reduce their operations or demand for the company's products; that the company may be unable to maintain the level of investment in research and development that is required to remain competitive; that there may be unexpected variations in market growth and demand for the company's products and technologies in light of the product mix that it may have available at any particular time or a decline in demand; the company will require additional funding and may be unable to raise sufficient capital on favorable terms, or at all; that global business and economic conditions will not continue to improve or will worsen; that demand for computers will be lower than currently expected; and the effect of political or economic instability, domestically or internationally, on our sales or supply chain. Investors are urged to review in detail the risks and uncertainties in the company's Securities and Exchange Commission filings, including but not limited to the Annual Report on Form 10-K for the year ended December 31, 2011. AMD, the AMD Arrow logo, AMD Opteron, AMD Radeon, and combinations thereof, and are trademarks of Advanced Micro Devices, Inc. Other names are for informational purposes only and used to identify companies and products and may be trademarks of their respective owner.